When it comes to getting superior results for power washing in Cape Cod and Southern Ma, it all comes down to the company you hire. Our goal is to provide you with the service that you need and make it as convenient for you as possible! By working with A to Z Softwash you can rest assured that the job will be completed thoroughly and with long lasting results, which is reflected in the stay clean warranty that only we offer. We treat our customers the way that we would want to be treated, if not better. 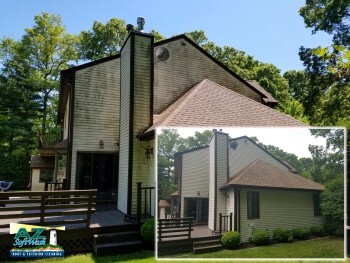 You will be amazed at the improvements you will see once we get done with pressure washing your home. We take great pride in the work that we do and always go the extra mile to get the job done right. Give us a call right now to find out why we are the top rated company in Massachusetts for exterior cleaning or to set up your appointment for pressure washing in Cape Cod. We are also able to offer top of the line professional cleaning for both residential and commercial clients. Did you know that pressure cleaning is technically a form of preventative maintenance? It is true because this is an ideal way to wash away potentially hazardous materials that rot away things like shingles and wood. If you want to extend the life and enhance the performance of your home, this is a great way to do so. Even if you are not planning on selling, you should realize that this is also a great way to add as much as $15k to the value of your home. Having a freshly cleaned exterior immediately adds to your overall property value. This is also the perfect way to help protect your loved ones from potentially hazardous contaminants. Mold, mildew and algae forming on the exterior of your home is still going to have a negative impact on those people living inside the home. Not to mention, removing these also helps reduce the likelihood of slip and fall hazards like slick walkways. Of course, there's more to it than just renting a power washer and going to town on your home's exterior cleaning needs. Certain cleaning agents and the right pressure - or lack of pressure - is needed depending on the surface being cleaned. Don't risk damaging your property. Let our experienced pressure cleaning experts take care of your house washing needs! From driveways to decks, complete houses to just the exterior windows, our crew can do it all, residential and commercial. 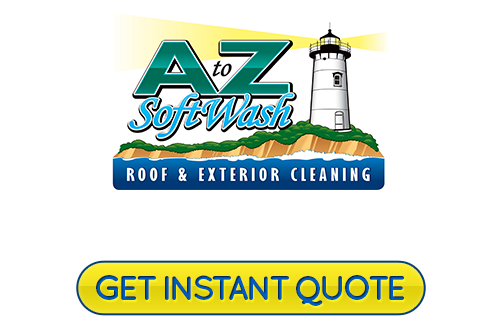 A to Z Softwash is the only Cape Cod roof cleaning and pressure washing company that you need to know for this level of quality workmanship. We want to be able to help you improve the look and condition of your home. Don't settle for less than the best. Give our team of pros a call and let us show you what a difference true quality makes. 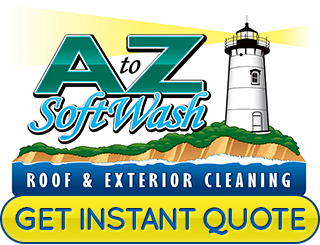 If you would like an estimate for pressure washing in Cape Cod, please call 508-209-7795 or complete our online request form.